I want to share with you my brief experience from within the psych ward. I started writing a book about it once, but it was too emotionally exhausting, so I put it away. Maybe someday I'll get back to it. I wrote in my journal while I was there, and when I got home, I used those entries to start a new blog (this one). I was in the throes of postpartum depression, but mostly a miserable marriage, and the after-effects of infidelity. My marriage didn't end up working out, but that's another story. I don't necessarily want to tell the world about my dark place, but if it will help ANYONE at all, it will be worth exposing myself. I have come such an incredibly long way since 2010 when I wrote these, but I'll forever be grateful for the perspective I gained in the midst of people who had legitimately let their minds go. If you are reading this, wondering if you are, in fact, crazy. I assure you, you are not. And to seek help, and friendship. 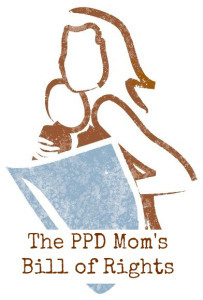 The Mother's Postpartum Depression Bill of Rights is a great place to start.